Owen Lars, was a moisture farmer on Tatooine, the step-brother of Anakin Skywalker, and the uncle of Luke Skywalker and Leia Organa. He raised Luke until he and his wife, Beru, were killed by Stormtroopers and left to burn along with their farm. 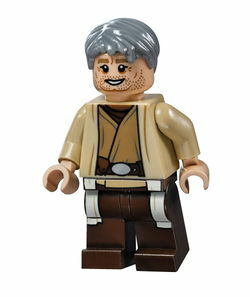 Owen's first variant has grey hair and a face with a stubble beard, while the main body features tan clothing and brown legs. In the film Owen had brown hair but as a minifigure he has grey hair. This page was last edited on 12 March 2016, at 01:00.